What are the best Charcoal Grill and Smoker combo? You will save a lot of money if you decide on getting a charcoal grill that comes with a smoker. This way, you’ll be able to use both at the same time, without having to buy separate units. This is also very efficient as all the cooking will be done in one place, and the cleanup can be done at the same time too. This is great if you like to host weekly barbecue parties or gatherings with your family or friends, or if you just want to whip up grilled or smoked goodies for dinner, any day you want. What to look for in a Charcoal Grill and Smoker Combo? 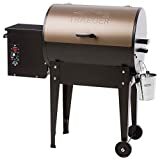 Size: The size of the Charcoal Grill and Smoker Combo is important, as the best choice will ultimately be determined by how you intend to use the device. You have to also consider the space arrangements you have on your property. If you are using it on an outdoor balcony that permits grill and smoker combos, allocate only a small portion of your backyard or have a much wider space to work with, your size in Charcoal Grill and Smoker Combo should reflect this. A larger grill is the much better option for a larger and more spacious yard and not that of a balcony. Most likely a larger backyard with a larger grill and smoker combo will be utilized to its fullest, accommodating the large space with large amounts of cooked meat. If you plan to fill the yard with people for parts and special occasions then this is the right combo for you. Smaller sized grill and smoker combos have the benefit of being more portable and requiring less maintenance, at the cost of less food produced. If you’re intending to only cook for a small amount of people and not expecting parties above 10 people then you’re better off with a smaller size. Materials Used: Essentially the materials used in the creation of the grill and smoker combo need to be strong and durable, as well as resistant to weather, rust and also prolonged exposure to heat and food. Having a grill that crumbles under every-day use is simply not an option and disappointingly there are some that do not last very long. Ceramic materials in the overall item help to create a strong, durable and lightweight to the charcoal grill and smoker combo, ensuring that the heat stays in the food is cooked to a better taste. Additionally you will want to make sure the cooking grates are made of a durable cast iron to allow them to withstand the heat. You will also want to investigate some of the additional features on the ceramic, as you can get blends that are coated with protection, scratch resistance and are also lead free. Safety and Warranty: Most manufacturers should offer at least one year on your Charcoal Grill and Smoker combo, however you should take out additional warranty if provided. The cost of this item can be somewhat hefty and you want to ensure that the possibility of faults will not impact on your back pocket. 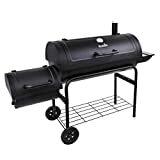 What are the best rated Charcoal Grill and Smoker Combo? This smoker grill has two cooking areas, the primary area with 288 square inches of space and the secondary area with 138 square inches of space. You’ll be able to smoke large meats in the bigger area while grill burgers, hotdogs, and other smaller meat in the secondary area. PROS: The body is coated with durable matte coating to withstand the changing weather outdoors. The cooking grates are also coated with porcelain to ensure that it lasts repeated use. It also comes with a small steel firebox where you can put fuel and pieces of wood for flavorful smoking. It is also easy to clean and store because of its clean-out door for ash removal and the wheeled legs for mobility. CONS: According to reviewers, this product is smaller than what they have anticipated. It will be good for small gatherings with family and friends but more than that may require you to upgrade to a bigger smoker/grill. This smoker/grill offers a 292 square inch primary cooking area that offers up to 19,500 BTUs and has a porcelain-coated cooking grill. The lid of this grill features a convection technology, which allows smoke and heat to circulate on your food. PROS: It has built-in Traeger Digital Thermostat that allows for precise temperature control. It uses pellets for cooking and has a steel construction for hardwood pellets that would automatically get the fire going. This means you don’t have to watch it all the time. Simply set it and then leave it. CONS: People don’t really run into trouble with this product but the very few ones who experienced problems didn’t get great customer support. Suffice to say, the customer service of Traeger isn’t one of the best out there. 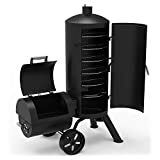 Unlike the two products previously reviewed, the structure of this smoker/grill is much different because the two are combined in just one vertical body. PROS: It has two chrome-plated steel cooking grills that can hold up to 50 pounds of food, which is great if you plan on cooking for a party. The front-hinged door also allows you to put additional charcoal/fuel and water with ease. CONS: May be difficult to get the food you have placed at the bottom because of the tier system. You have to take out what’s grilling/smoking on top before you can access the bottom grill. It is suggested to place whatever cooks fast on top because the temperature inside the entire body is the same. A charcoal grill and smoker combo is definitely nice to own if you love barbecues and smoked goodies. It enables you to cook both at the same time in the expense of your own home without having to spend too much. Additionally if you live in an apartment that allows you to have one on your balcony, a grill and smoker combo can add the usability of your entire place and add variety to your cooking.